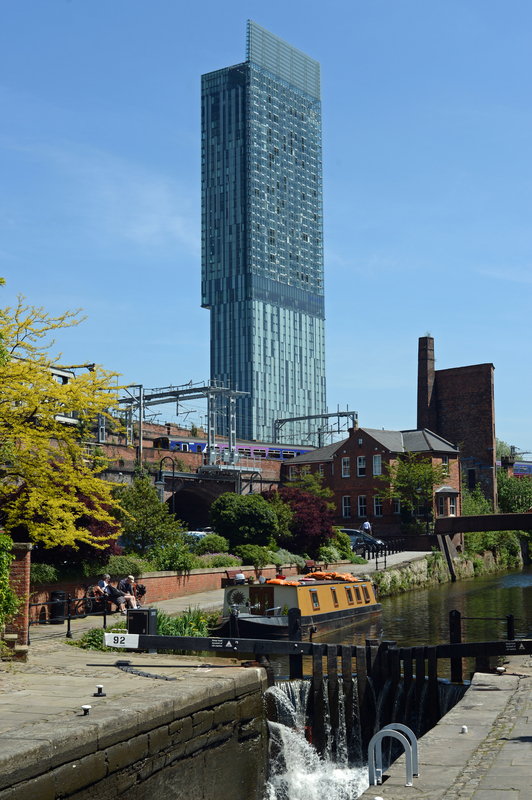 Earlier this week I took advantage of the glorious weather & spent a couple of days shooting pictures in Manchester. What I saw on my travels made me realise what a vibrant & expanding place the city has become. 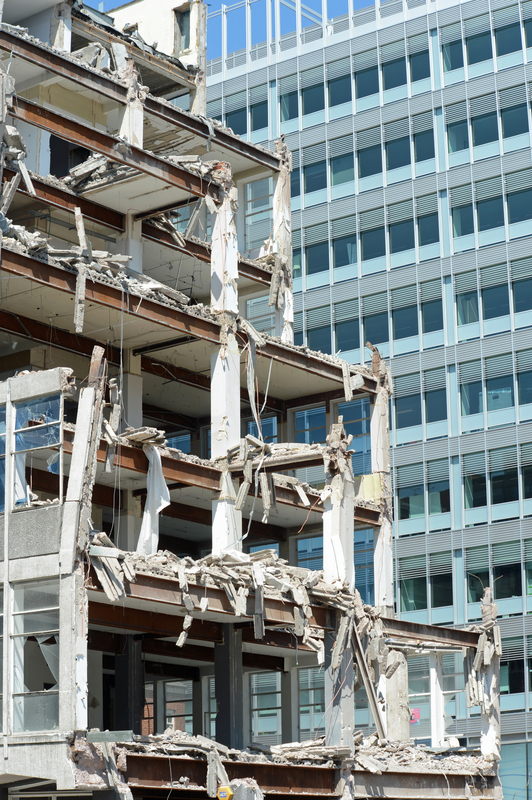 I first got to know Manchester back in the 1970s when it was a city in decline. The old industries were dying & the city centre reflected that. The place has been on the up since the late 1990s but the pace of change seems to have reached new heights. The amount of new building in the city is astonishing, not just in Manchester itself, but in Salford too. 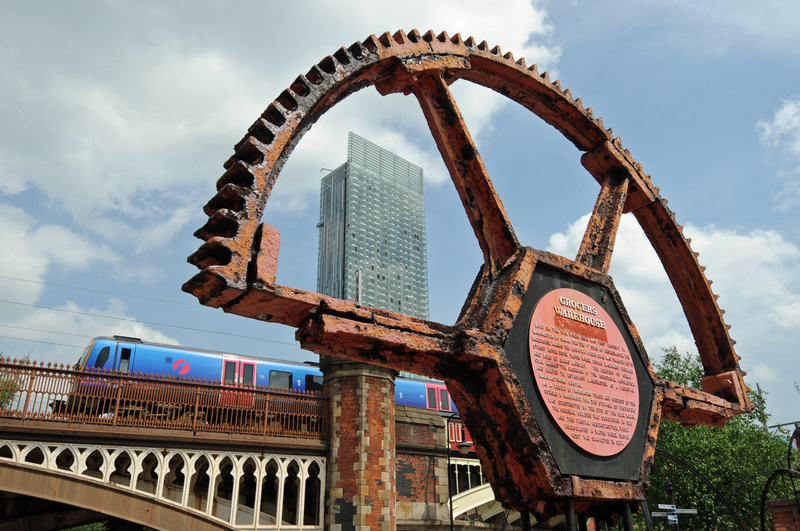 One of the places I visited was the area around Salford central station. Redevelopment in the area has opened up new opportunities to get shots of the railway passing through the city. I’d been eyeing up construction of a multi-storey car park adjacent to the station. As it had opened I took the chance to see what views were available from the top floor & I was pleasantly surprised with the results. As I took in the views I realised just how much the city skyline has changed in the last decade. 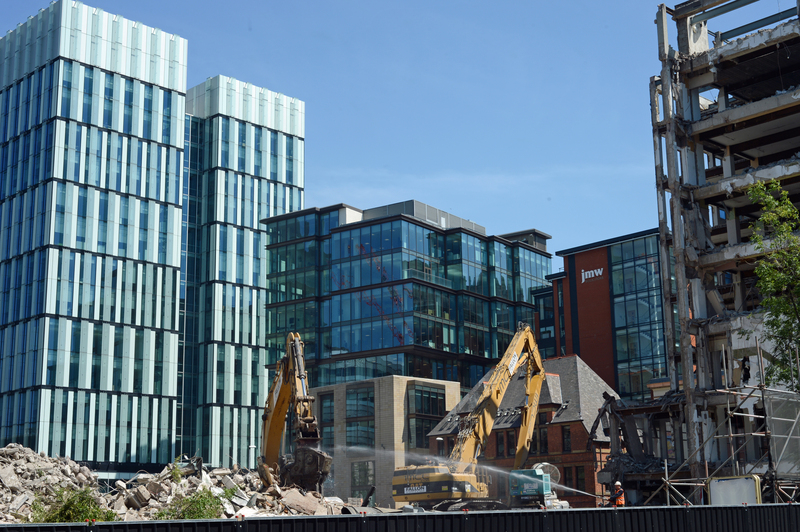 New buildings have appeared in all directions, especially towards the city centre. 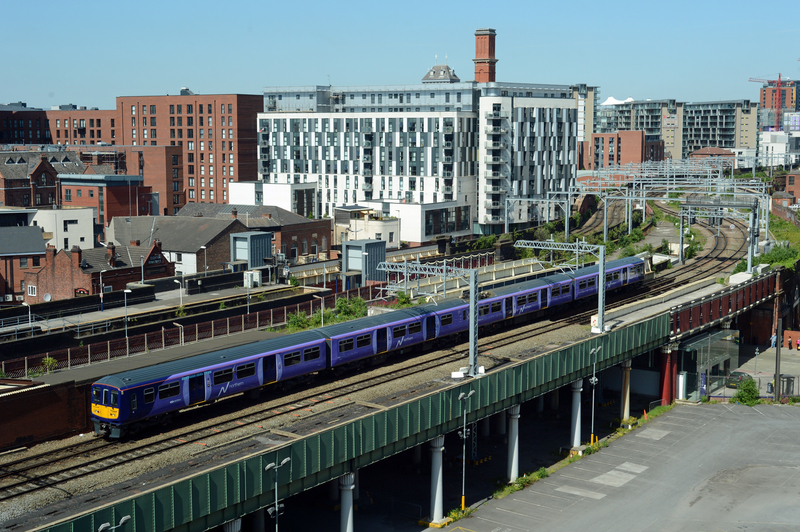 A few years ago the former railway goods yards around Salford central station were given over to car parks. Now those car parks are being built on as millions of pounds are invested in the area. This article from the Manchester Evening News describes what’s happening. Here’s a selection of shots taken from the roof of the car park. The approaches to Salford Central from the East,looking towards Manchester Victoria. Northern’s 319386 approaches with a service to Liverpool Lime St running on the newly electrified route via the original Liverpool & Manchester railway. 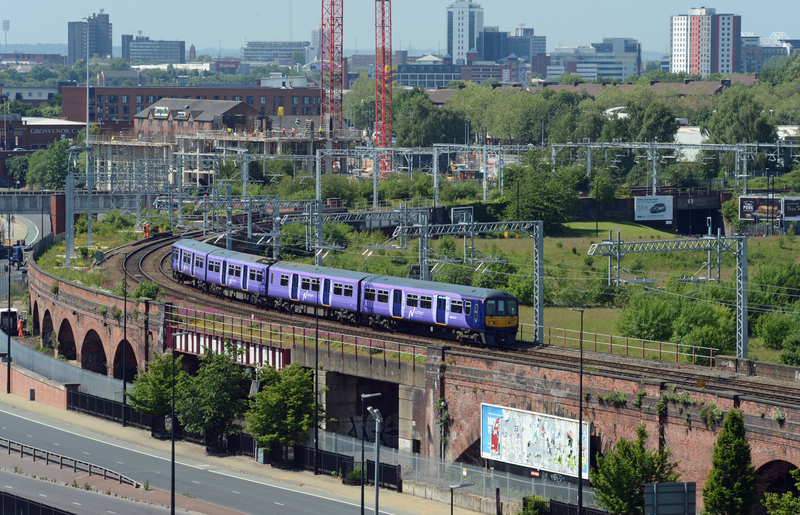 319371 is checked at signals adjacent to Salford Central station as it heads for Manchester Victoria. The city’s changing skyline is evident in the picture. 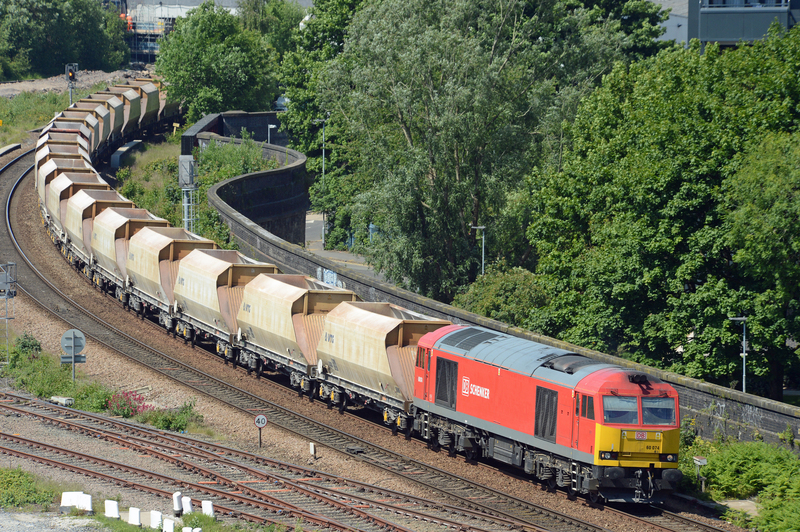 60074 passes Salford West Junction with 6H43 the 11.10 Pendleton to Tunstead empty stone train. 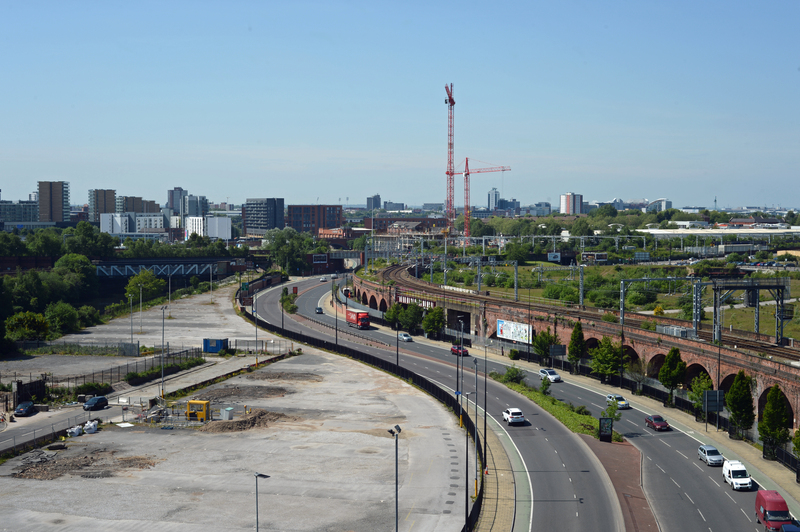 The area’s set for further change once construction of the Ordsall curve gets underway. This will be a new viaduct creating a triangular junction to allow trains from Manchester Victoria to run through to Manchester Piccadilly. You can find the details here. 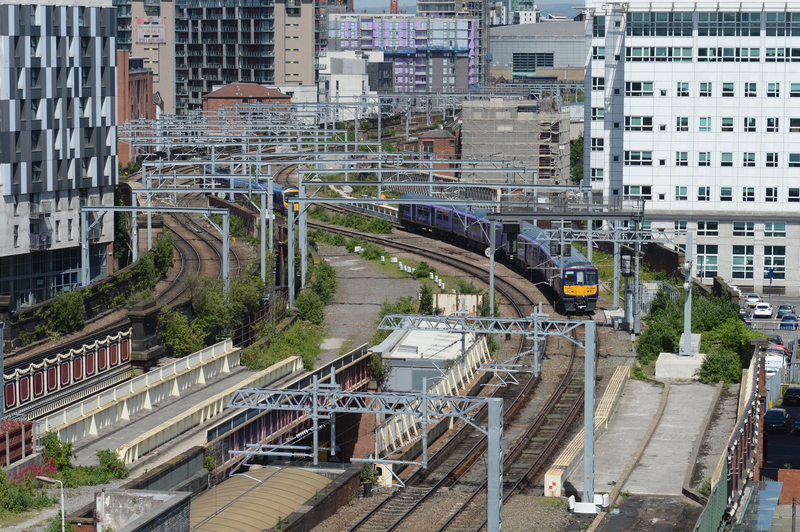 The new line will cut across the dual carriageway & car parks shown in the foreground of this picture, before crossing the River Irwell on a viaduct. Just across the road from all the new building is the Castlefield conservation area – one of my favourite bits of the city. It’s a fascinating mix of eras that stretches right back to Roman times. There’s a rich mix of architecture & industrial archaeology. The area contains the world oldest railway station (Liverpool Rd, which is now a museum) as well as some superb bridges. 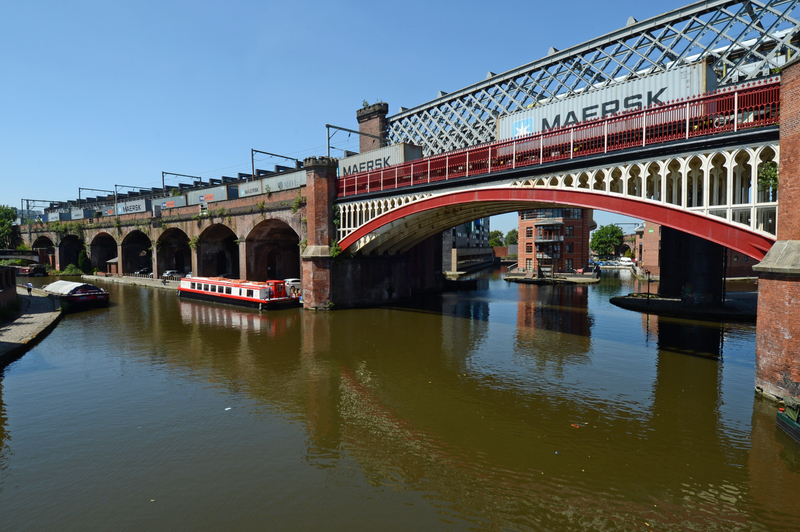 Castlefield is criss-crossed by railways & canals which make a fantastic setting for pubs & restaurants which have sprung up in former warehouses & factories. Needless to say it’s also a great area for photography. Here’s a selection of shots from the area. There’s a plethora of plaques in Castlefield. 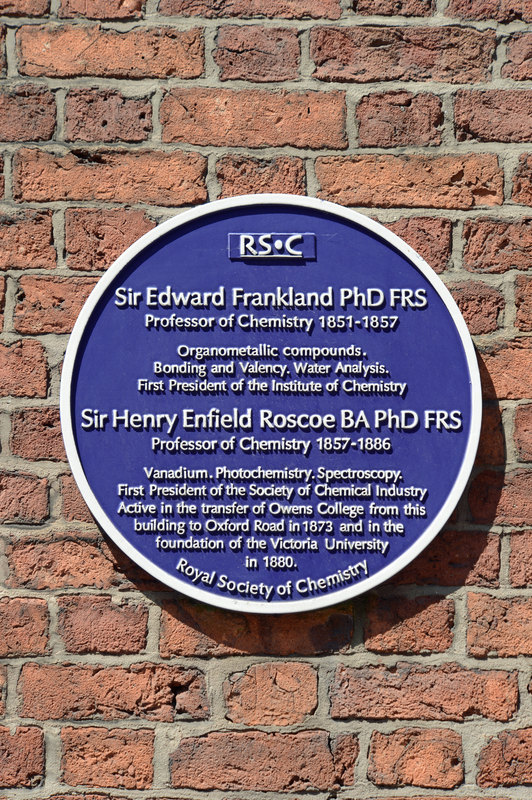 This one celebrates the areas links with education & chemistry. 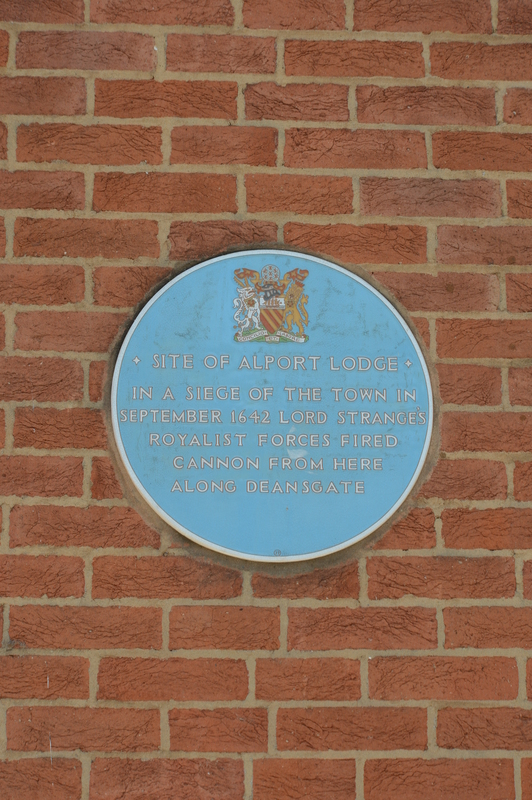 This plaque celebrates less settled times when the area was a battlefield in the English civil war. Leaving Castlefield behind I headed across to the old Manchester Central station to take a look at the expansion of Manchester metrolink. I’ll describe what I found in part 2. Sorry for the lack of blogs this past week. To say life is hectic at the moment really doesn’t do things justice! I’m typing this from Costa Coffee in Manchester Airport whilst I wait for my flight to Dusseldorf. I’m heading back to Germany for the second time this month on yet another press trip – this time to have a look at some of the other projects the company are involved in besides the Class 700s for the UK. It’s going to be a hectic (but fascinating) couple of days. Siemens are my hosts & their events always provide plenty of interest. I’m particularly looking forward to learning more about the new Avenio trams they’re building for Doha which will run without overhead wires – a technology that could be very useful in our growing cities. That aside, I can’t say I’m a fan of kicking my heels in airport lounges – especially this time of morning, but when needs must – at least there’s a welcoming Costa Coffee & free wifi here. The lounge is a melange of people here for different purposes which is reflected in the destinations up on the departure board. There’s business folks like me heading off to locations such as Aberdeen, Dusseldorf, or Dublin, whilst the hen parties & tourists we’re rubbing shoulders with are heading off to Ibiza, Alicante & Amsterdam. Despite the earliness of the hour, terminal three is surprisingly busy. Mind you – that could be just my perception as the place isn’t exactly large. Heathrow it isn’t.